Ph. D., Zoology, University of Hawai‘i at Manoa, Honolulu. M.S., Biology, University of South Florida, Tampa. B.S., Biology, University of South Florida, Tampa. Foraging ecology of marine vertebrates. Field and survey work in Florida, North Carolina, Hawai‘i, and Fiji. Assistant Zoologist, Bishop Museum, Honolulu (2003-present). 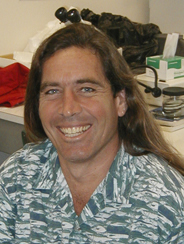 Adjunct Faculty, Hawaii Pacific University, Honolulu (2003-present). Research Associate, Hawaii Cooperative Fishery Research Unit, Honolulu (2003). Lecturer, University of Hawaii at Hilo, Hilo (2002). Postdoctoral Fellow, Hawaii Institute of Marine Biology, Kaneohe (2001-2003). Longenecker, K.R., R.A. Dollar, & M. Cahoon. In Press. Increasing taxonomic resolution in dietary analysis of the Hawaiian monk seal. Atoll Research Bulletin. Longenecker, K.R., & R.C. Langston. In Press. Life history of the Hawaiian Blackhead Triplefin, Enneapterygius atriceps (Blennioidei, Tripterygiidae). Environmental Biology of Fishes. Dye, T.S. & K.R. Longenecker. 2004. Manual of Hawaiian Fish Remains Identification Based on the Skeletal Reference Collection of Alan C. Ziegler and Including Otoliths. Society for Hawaiian Archaeology Special Publication 1. 134 pp. Coles, S.L., P.R. Reath, K. Longenecker, H. Bolick & L.G. Eldredge. 2004. Assessment of nonindigenous marine species in harbors and on nearby coral reefs on Kaua‘i, Moloka‘i, Maui, and Hawai‘i. Bishop Museum Technical Report #29. 180 pp. Longenecker, K.R. 2004. Virtual comparative collection of diagnostic fish structures. Hawaii Biological Survey No. 2004-006. 16 pp. Coles, S. L., Eldredge, L. G., Kandel, F., Reath, P. R., & K. Longenecker. 2004. Assessment of nonindigenous species on coral reefs in the Hawaiian Islands, with emphasis on introduced invertebrates. Bishop Museum Technical Report # 27. 106 pages.